Stay cool this summer, even if a conventional central air conditioning system or a window unit is out of the question. There are other options -- two distinct types of coolers, both of which are referred to as "mini air conditioners." The first, and most common, is a ductless ("mini split")air conditioner system, and the second is a portable air conditioning unit. A ductless air conditioning system is simple to install even if you don't have ductwork; it also offers a few advantages over regular central air systems. Since they operate on zones, mini air conditioners give homeowners the ability to set different zones to different temperatures. For example, if the kitchen, dining room and living room are one zone, it can be set to a cooler temperature than, say, an office area which is not used as often. Being able to regulate indoor climate saves you money on electric bills, is less taxing to your system, and is kinder to the environment. Without ducts or an attached compressor, you might be wondering how such a system works. It’s simple. A compressor unit sits outside and a line for refrigerant, condensation and electricity runs between this unit and interior zone units. The indoor units are operated and adjusted by remote control. Mini-split air conditioners offer homeowners a great deal of control. Central air cools an entire house to a specific temperature, but a mini A/C system allows each zone to be set individually for ultimate interior climate control and energy efficiency. Systems with one to four indoor zone units are available. Since they don’t rely on ductwork, mini air conditioners are ideal for room additions, attic conversions, sun rooms and other spaces that may not be serviceable by a central air conditioning unit. Another advantage, particularly for room additions, is that units with heat pumps are also available. The biggest disadvantage is price. 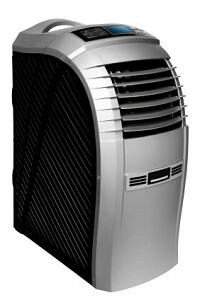 A mini split air conditioner runs $1,500-$2,000 per 12,000 BTUs (or per ton), which will cool 450-550 square feet. This is twice as much as a window unit. You will also need to hire an HVAC professional for the installation. The indoor units are long and slim and usually hung high on the wall, while new lines also run on the outside of your home. These are considered eyesores by some people. Aside from window units, which can pose a security issue as well as looking unattractive, there is only one other kind of truly portable air conditioners. Generally referred to as PACs (though some people call them mini ACs), these are freestanding units that cool a room approximately as well as a window unit does. The units look a lot like dehumidifiers. They must be manually drained or drained out of a window using a window kit. Some units are self-evaporating and require no drainage. When reading online reviews of portable air conditioner units, you'll find the biggest complaints are about the noise and the cost. Expect to pay more for a portable unit than a window A/C. Portable units also require twice the amount of BTUs to cool the same size space. Many people use portable air conditioners in places that aren't serviced -- or aren't serviced well -- by central air, such as a garage, room addition or sun room. Expect to pay a minimum of $400 for a basic unit and over $1,000 for a sophisticated one that features self-evaporation, an independent dehumidifier, a quality air filter, an adjustable thermostat and more. If central air isn't an option and a homeowners association, apartment complex or historical society doesn't allow window units, homeowners and renters still have the option to stay cool at home in the summer with mini air conditioners.